The Roland V-40HD multi-format live video switcher is the latest iteration added to the mighty V-1600HD and V-800HD model lineup. The V-40HD is perfect for live events or an installation that necessitates the freedom to combine a variety of sources whether they be digital or analogue, computer or video format. It is particularly well suited to support configurations using popular HDMI cameras and computers. The V-40HD supports true multi-format video – there’s no need to match input sources to the output resolution. Every input has its own broadcast quality scaler that individually adjusts each source as necessary to translate to any output resolution chosen. 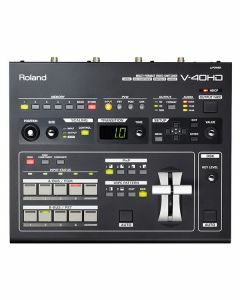 The Roland V-40HD has twelve inputs on four channels plus one (background), and five output connectors with independent scalers on the inputs and outputs. This makes it possible to connect HDMI/DVI, RGB, component and composite sources. Input/output resolutions up to 1080/60p or 1920x1200 are therefore supported. The V-40HD is also HDCP compliant. Equipped with four input system, each of the V-40HD’s systems has three types of input connector: HDMI, RGB/Component, and Composite. This means the user can connect a total of twelve video devices. For output, the V-40HD offers three systems: Output (HDMI, RGB/Component, Composite), Output two (HDMI, RGB/Component), and Preview (HDMI). Sampling rate: 4:4:4 (Y/Pb/Pr), 10 bits *Output signal processing is 4:2:2/8-bit. Weight: 3.4 kg 7 lbs. 8 oz.